During the Financial Crisis, it was California that made the headlines with “out-of-money dates” and fancy-looking IOUs with which it paid its suppliers. 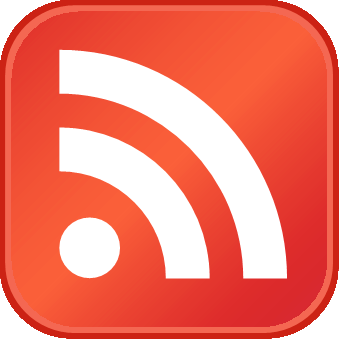 The booms in the stock market and the startup scene – the state is desperately hooked on capital-gains tax revenues – but also housing, construction, etc. sent a flood of moolah into the state coffers. Now legislators are working overtime to spend this taxpayer money. Gov. Jerry Brown is brandishing recession talk to keep them in check. Everyone knows: the next recession and stock-market swoon will send California back to square one. Now Puerto Rico is in the headlines. It’s not even a state. And it’s relatively small. But look at wild gyrations by the federal government and Congress to deal with it, to let the island and its bondholders somehow off the hook. But Puerto Rico may just be the model. Big states are sliding deeper into financial troubles, particularly New Jersey, Connecticut, and Illinois. 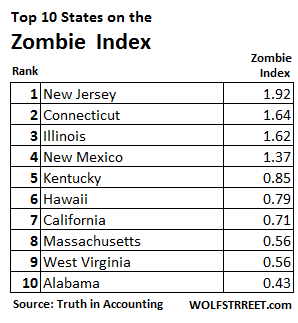 These three states hold the top positions in the “Zombie Index” that Bill Bergman, Director of Research at Truth in Accounting, developed two years ago. California has dropped to 7th place. Whew!!! And the share of total debt effectively “hidden” off the balance sheet. This “taxpayer burden” is not a reflection of actual state taxes paid, but of the state’s total liabilities per taxpayer – such as outstanding bonds and loans and off-balance-sheet liabilities such as for pensions. The index is named after a term coined by Ed Kane, professor of finance at Boston College. Kane wrote two books warning us about the S&L crisis back in the 1980s and early 1990s, before we knew what hit us. Kane used the term “zombie bank” to identify insolvent firms that were allowed to stay open by regulators, frequently with the aid of false regulatory accounting principles that delayed the recognition of insolvency. Many of these firms ended up “gambling for resurrection,” in Kane’s terms, and these incentives ended up trebling the cost of the S&L crisis when many gambles went sour. Kane’s careful history indicates that this risky behavior and the financial conditions of these zombie banks were hidden by less-than-truthful accounting practices. There are alarming parallels to the financial crises faced by many state and local governments today. These questionable accounting practices have allowed hundreds of billions of dollars of pension debt to accumulate outside governments’ audited balance sheets. This state of affairs is all the more ironic in light of the balanced-budget requirements that are widespread in state and local governments. Government leaders regularly proclaim their fidelity in living up to the spirit of these laws. 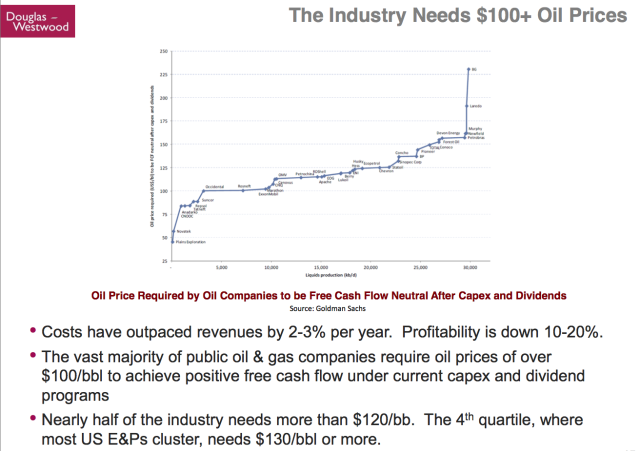 But false accounting practices have allowed real expenses (and debt) to accumulate anyway. Taxpayers and citizens have been left in the dark. Larger states tend to show greater deterioration in their “Taxpayer Burden” from 2014 to 2015, as well as from 2009 to 2015. 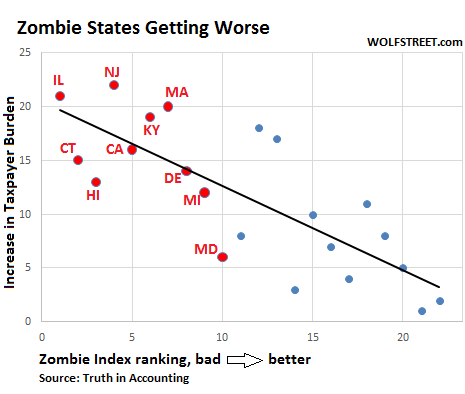 And states ranking high on my Zombie Index have been getting worse, as well. Here’s a chart of 22 states for which Truth in Accounting analyzed the 2015 financial results. It compares their five-year average Zombie Index rankings (so not the most recent rankings as in the table above) to the change in their “Taxpayer Burden” from 2009 to 2015. It shows that the worst states on the Zombie Index (red markers, 5-year average rankings on the Zombie Index axis) are also those states whose “taxpayer burden” has increased more (left axis). Sadly, and perhaps alarmingly, these findings may point to a “too-big-to-fail” problem in state government finances, similar to a TBTF problem in banking. We may have a significant moral hazard problem operating, if larger states are assuming their failures may be cushioned by federal resources. Especially if Uncle Sam has already been pursuing, in the words of the Financial Report of the U.S. Government, “unsustainable” fiscal policy. Politicians can kick the can down the road for many years. It works for an amazingly long time. They can adjust accounting practices to where the biggest problems – such as obligations related to pensions and other retirement benefits – are neatly swept off the balance sheet and thus out of the public eye. They’re already doing it: For example, governments are issuing “Pension Obligation Bonds” – they’re borrowing money from Wall Street to fill the holes in the state’s obligations to the already underfunded pension systems, and they’re gambling that total investment returns are 7.5% for evermore, even after the most phenomenal stock, bond, and real estate booms in memory. 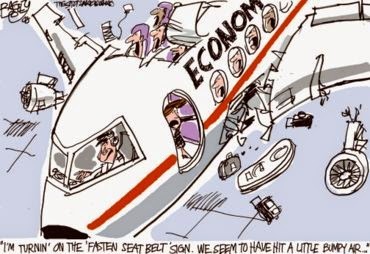 And then, much like the banks, they’re counting on a bailout from the Federal government or better yet the Fed. Because who can stomach seeing Illinois go bankrupt?